Hey, why should your guy keep his wet swim trunks (or speedo) in a plastic hotel bag? Let him travel in style! 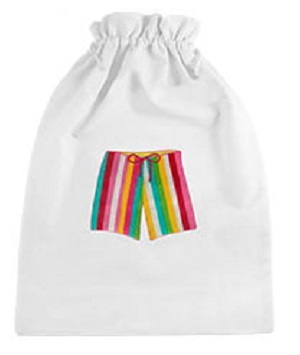 This cute embroidered, waterproof-lined drawstring travel bag is perfect for any damp speedo, swim trunks or even your bikini! Makes a great honeymoon gift (with the matching bikini bag)! Measures 13" X 17"